Olentangy Liberty senior Ben Roderick cuts down the net after the Patriots won a Division I district title with a 72-65 decision over Hilliard Davidson earlier this month. 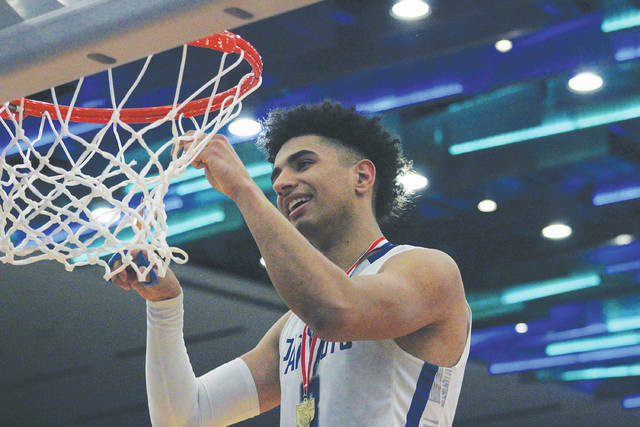 Roderick, the All-Delaware County boys basketball Player of the Year, averaged 27.4 points and 7.7 rebounds per game while leading the Patriots to their first-ever trip to the state final four. The All-County teams were selected by Delaware Gazette sports editor Ben Stroup and freelance writer Michael Rich.